It appears that I am on a roll, but appearances are deceiving. I am having trouble finding pictures of several HOFers in their final seasons (e.g., Perry with the Royals and Wilhelm with the Dodgers), so I guess I'm putting a call out to others to see if they can find pics of these players in those unis. Anyways, I'm heading to Washington today, so I need to post early before I head out. Next up would be a card that Collective Troll should have had to collect. 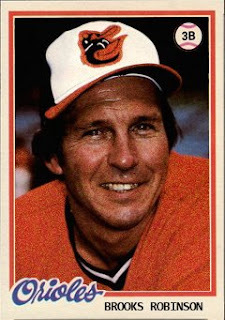 The 1978 set should have had a Brooks Robinson card besides the lame Topps attempt at highlighting a HOFer's final season. Brooks, better known as the Vacuum Cleaner, is and probably always will be the best fielding third baseman in the history of baseball. Since his playing days ended, no one has ever come close to matching his fielding prowess. Third base now is a glorified 1st base position. All power and little substance. Brooks owned the Gold Glove from 1960 until 1975 and earned every bit of a it. 2,697 put outs at third and a .971 fielding percentage. Hot corner awesomeness. Brooks was also decent at the plate coming painfully shy of the 3,000 hit mark. Also, not many players begin their career at the young age of 18 anymore. i really like the brooks! btw, i'm still up for a trade - let me know!